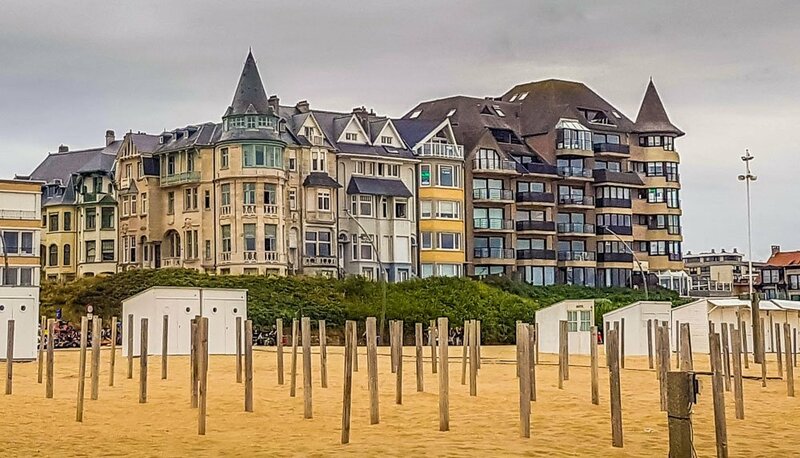 A walk from the French border and into Belgium on a family short break was a delight, our walk began in Bray Dunes in France, very close to the Belgian border. Just a short walk from our accommodation in Bray Dunes and visible from our apartment window was the border line. 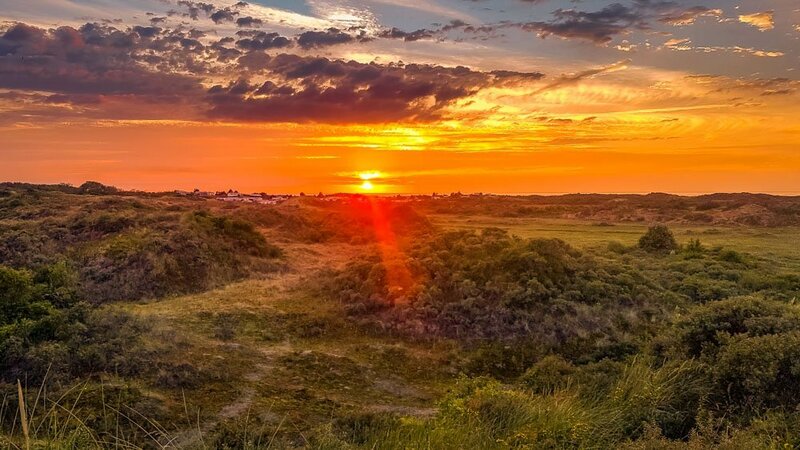 Behind the accommodation a beautiful nature reserve with dunes to explore, with semi-wild Konik horses on the nature reserve, but equally as close, a canal side walk through France and Belgium with some curious well cared for horses and ponies watching on. We made the most of our time exploring the area and took a walk through the dunes along a way marked trail towards De Panne, Belgium. The sand is super soft, and the trail is tranquil through the nature reserve. Even though the weather had begun to change and was drizzling with rain, I still found it peaceful and enjoyable through the reserve. 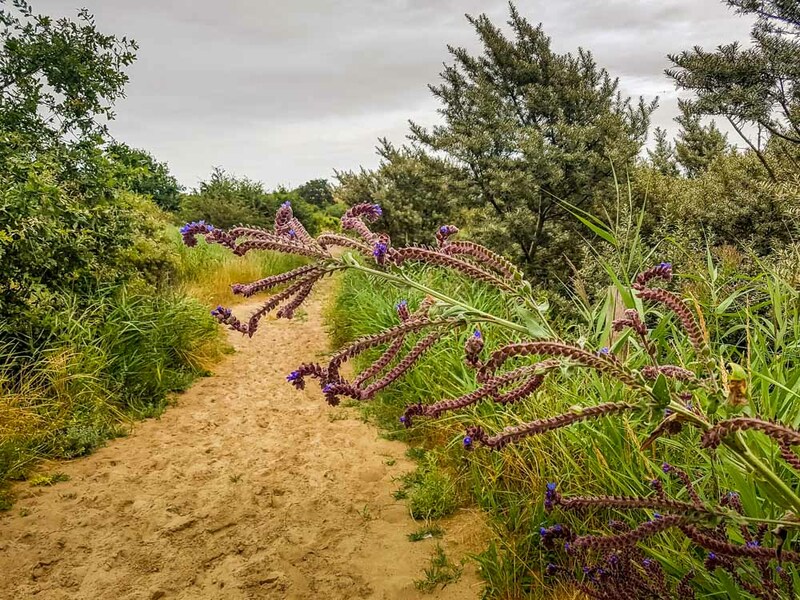 The beach was an estimated 2 miles or so from the entrance of the reserve and goes up and down dunes throughout, way marked trails leading off from the main path intrigued me but if we were to get to De Panne, the route was ahead and to the beach. 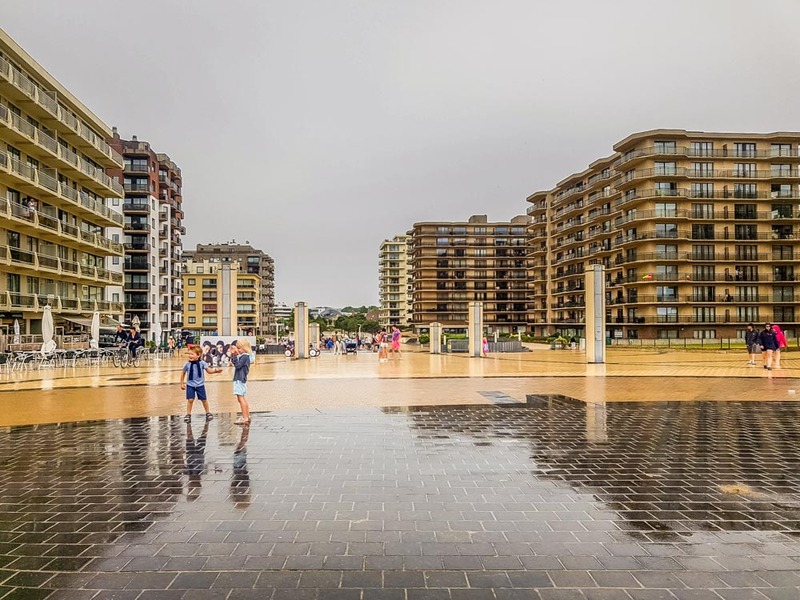 Once we’d reached the beach on the border of France and Belgium the weather was still increasingly wet, and my main camera had to go into my bag. Rain coats were dress of the day, but our spirts stayed high nonetheless. To the left of us was Bray Dunes and further along, Dunkerque, Northern France, and to the right of us De Panne, Belgium. We got ourselves organized for the remainder of the walk, Rain coats on and shoes off, well a beach is still a beach even in the rain, I’ll still walk barefoot! The beach walk was taken at a steady chilled out pace and De Panne, just another couple of miles away, we could hear music drifting on the wind and were curious about the origins, our pace quickened as the music grew ever louder and became more discernable until we realized it was a walking band playing, the music was good and quite catchy. As we turned a corner beside a tall sand dune, we could at last see and hear the band play quite legibly. 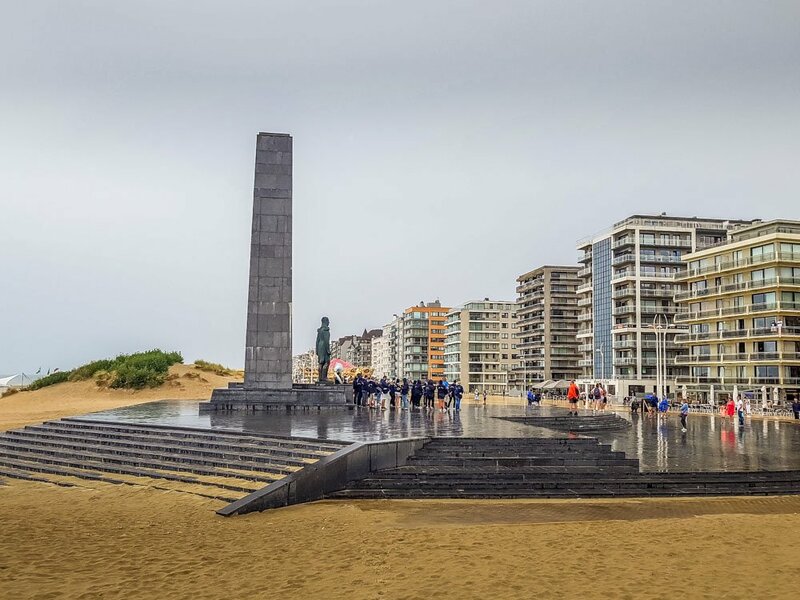 The event was taking place in front of the Kind Leopold 1st monument on the beach, king Leopold 1st was the first King of Belgium after the independence of Belgium in 1830, King Leopold reined from July 1831 to December 1865. The inscription in Latin, ‘Here is Leopold the first king of Belgium on 17th day of July anno 1831 entered on Belgian ground and received liberty.’ The monument was a striking image to great us, so sleek and grand is the structure in Belgian stone and Bronze and in the rain, it was shining with water on the surface, making it seem even more dramatic and inspiring. The first king of Belgium, the then prince Leopold of Saxa-Coburg-Gotha first set foot in Belgium on the 17th July accompanied by a squadron of the French cavalry, he drove from Dunkerque across the beach and entered De Panne at the Belgian border. At the border, the new king was greeted by the interior minister de Sauvage and the generals Chastelain, Comte d’Haene and Baron d’Hoogvorst. 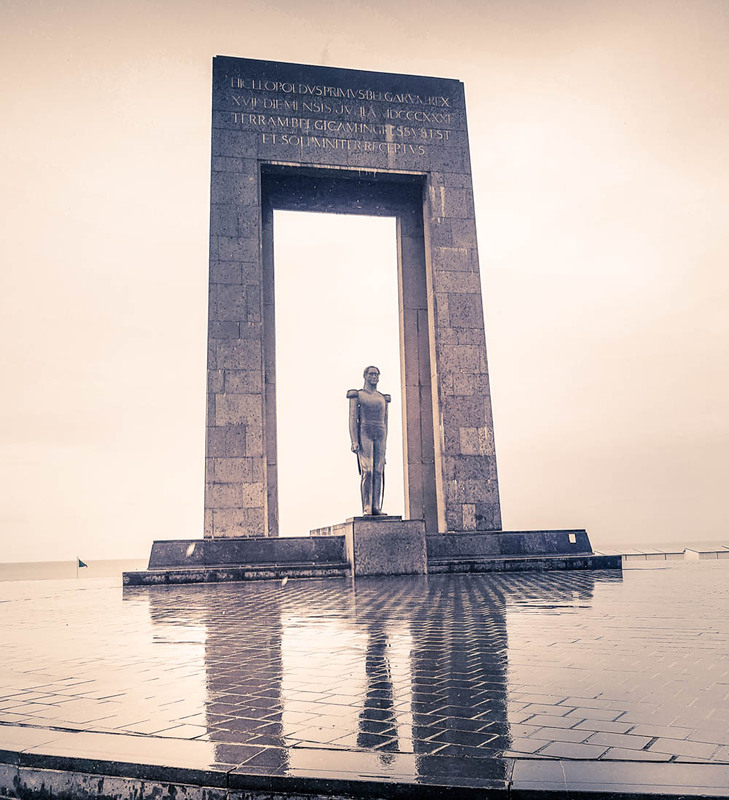 The King Leopold 1st Monument was designed by the architect, Victor Martiny and was opened officially on the 5th Oct 1958 by mayor Gevaert in the presence of king Boudewijn and prime minister Gaston Eyskens. I was not expecting a greeting such as this as we approached De Panne. We stood for a good while atop of the tall sand dune, listening to the band play and people singing beside the giant, dominating monument. The rain was beginning to calm to just a drizzle by now as the band walked off through the plaza, still singing as they disappeared into the distance. From here we took a stroll along the Promenade where there’s plenty of busy bars, restaurants and cafes. 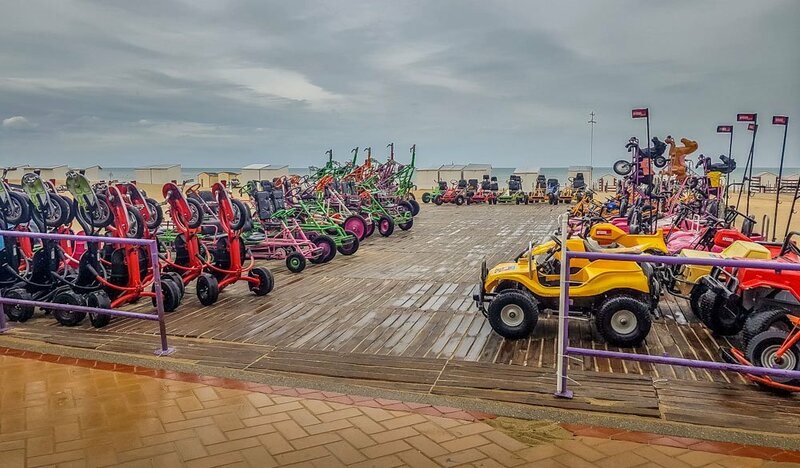 Another thing I noted was the different types of architecture along the promenade from old to the very new and a wide variety of peddle cars for hire, from designs such unicorns and ponies to family sized peddle cars for riding along a dedicated track that stretches the length of the beach front. Further onto the beach there are rows upon rows of different coloured beach huts. 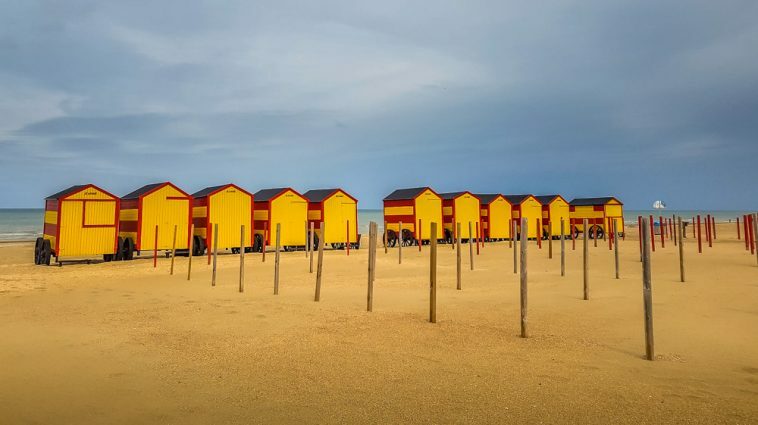 There’s something magical about a beach hut, I can’t pinpoint it, but I just love them, they come in all kind of colours and they’re so cute, but above all else bring back childhood holiday memories to me, it was lovely to see them along the beach in De Panne. Walking back was now the plan and the tide was turning, the rain by now had stopped too. 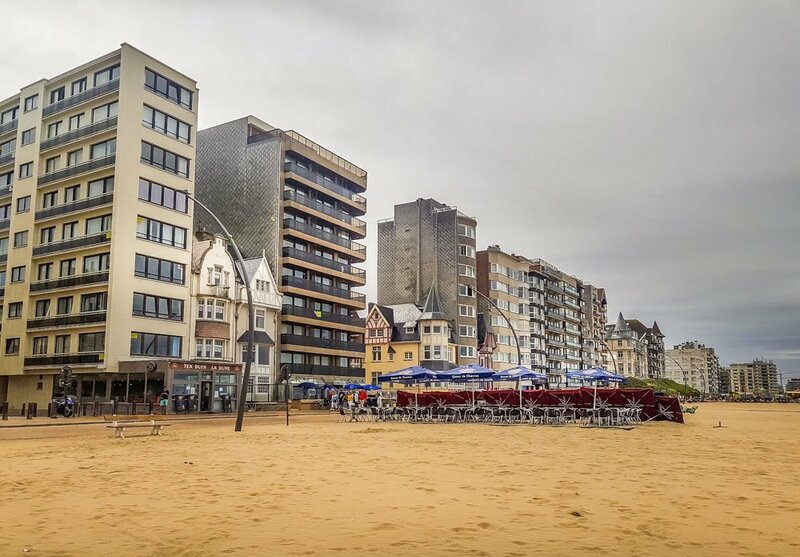 Still barefoot, I rolled up my jeans and paddled in the sea as we walked back along the beach toward the French border, leaving De Panne behind. It was a lovely calm walk along the shore with the sounds of the sea gently lapping up the beach as the tide came in and occasionally splashing up my jeans as the tide caught me out! Within sight the sand dunes which hide the nature reserve and the exit from the beach so soon. Once back onto the nature reserve track, I’d decided to detour a little onto one of the side paths leading further into the reserve, where we were shocked and delighted to find a small herd of semi wild Konik horses, (Konik horses/ponies are by nature semi-feral and originate from Poland, Konik refers to a small Polish horse breed, stocky and with primitive characteristics resembling the extinct Tarpan.) . This group of Koniks were so bonded with each other and reacting together as a unit, so unlike domesticated horses that seem to react more to humans and often will come forward for attention as a person approaches their paddock. 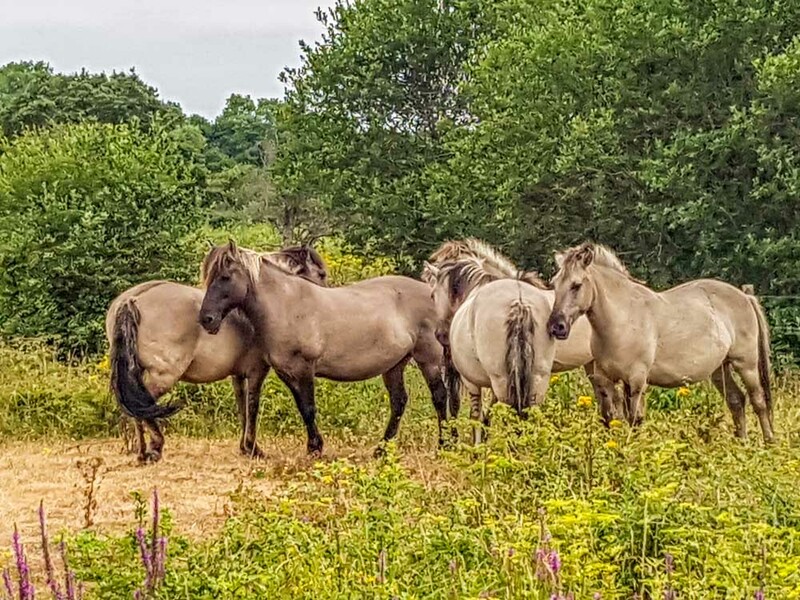 These gorgeous Konik horses were giving each other attention, nuzzling one another and are clearly a close-knit group living on the nature reserve in Belgium, our presence was of no consequence to them, apart from keeping an eye us. For me this was a wonderful experience that I’ll never forget. I noticed a lot of built up areas around, which also means nice places to eat and drink too. The nature we discovered and the lovely locals make up for more built up parts. Yes it’s a beautiful walk from France to Belgium, indeed especially if you pause to wander and take it slow. Further from the coast, I also enjoyed the Belgian canals too. Sounds like a good walk.years back I once walked from the French to Dutch border up the coast of Belgium. 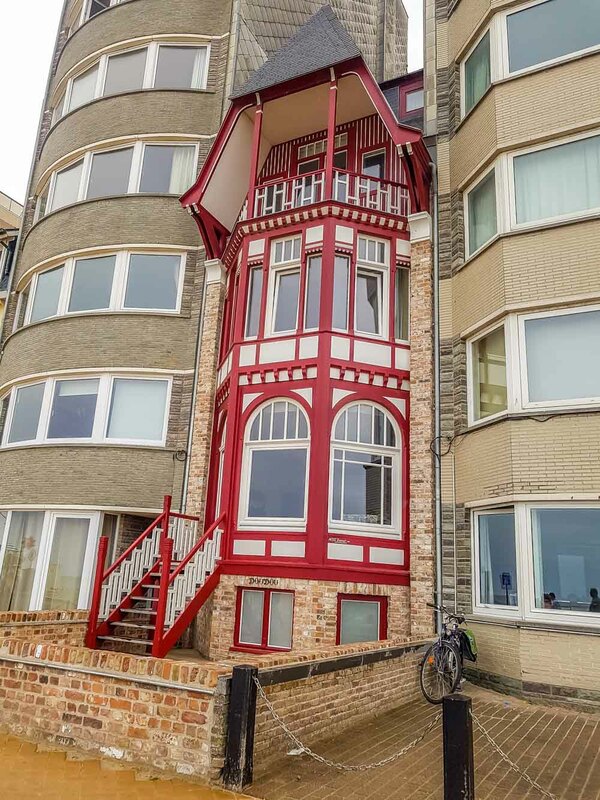 I was lucky enough to have good weather.the Belgian coast in very built up although there’s little bits of country side,not much.